In 2017, Crowned Heads released the Four Kicks Maduro, a regular production maduro extension to the popular Four Kicks line. When Crowned Heads launched in 2011, the company’s debut release was Four Kicks – an Ecuadorian Habano blend coming out of Ernesto Perez-Carrillo Jr.’s Tabacalera La Alianza. Four Kicks Maduro is the third blend released under the Four Kicks line. It’s a change of pace cigar in that it uses a Connecticut Habano maduro wrapper – something not too commonly found on a maduro cigar. 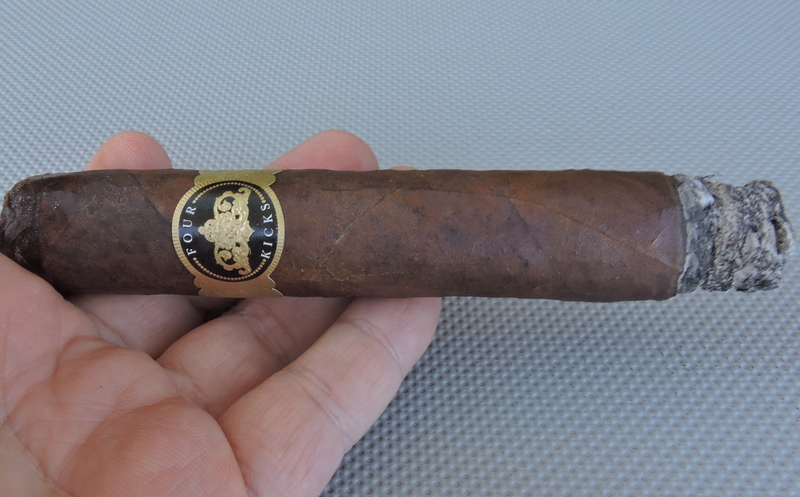 Today we take a look at the Four Kicks Maduro in the Robusto Extra size. Four Kicks is not only a cigar that was the first line released by Crowned Heads, but it’s a cigar that goes back to the roots of Crowned Heads and its philosophy. The name Four Kicks comes from a song by a band called Kings of Leon. Kings of Leon is a band that hails from Nashville, Tennessee, which is the home base for Crowned Heads cigars. The song has a rebellious theme which also fits into the theme of Crowned Heads as the company was started by four former employees who departed the CAO brand following the acquisition of the brand into the General Cigar portfolio. Finally, Crowned Heads co-founder Jon Huber has a known passion for music and the name seemed very natural for a Crowned Heads release. The initial Four Kicks became a big success for Crowned Heads and quickly put the company on the map. Soon, many fans of the line wondered when a maduro counterpart would come out. 2015 would see a limited production Connecticut Broadleaf version of Four Kicks released: a shop exclusive to Famous Cigar called Four Kicks Black Buckle. As mentioned above, 2017 saw the release of a regular production maduro offering with the Four Kicks Maduro. The Connecticut Habano wrapper was tobacco that was procured by Ernesto Perez-Carrillo. While it is common to see Ecuadorian Habano Maduro and Nicaraguan Habano Maduro, not so much with Connecticut Habano. Probably the best-known example of a cigar using this wrapper is the Partagás Black Label by General Cigar Company. Without further ado, let’s break down the Four Kicks Maduro Robusto Extra and see what this cigar brings to the table. The Four Kicks Maduro keeps to a similar recipe as the original Four Kicks. Both use Nicaraguan tobacco in the binder and filler. The difference is the Connecticut Habano Maduro wrapper used on the Four Kicks Maduro versus the Ecuadorian Habano wrapper on the original Four Kicks. Four Kicks Maduro was launched in four sizes. Each is packaged in 24-count boxes. The Connecticut Habano wrapper of the Four Kicks Maduro Robusto Extra had a rich chocolate-brown color to it. Upon closer examination, some darker mottling could be seen on the surface. There was a light coating of oil on the surface. The surface of the wrapper had a slightly bumpy feel to it. There were some thin visible veins and the darker color of the wrapper did a nice job of hiding the wrapper seams. The Four Kicks Maduro band uses a similar design to the original Four Kicks Habano, but with a different color scheme. The front of the band features a gold crown on a black background. Over the crown is the text “FOUR” in white font, with “KICKS” below the crown also in white font. Most of the rest of the band has a gold foil design. There are three medallions on the left and right side of the band, adjacent to the front. The left logos have a “star” on them, while the right medallions are more themed around the rebellious nature of Four Kicks. Prior to lighting up the Four Kicks Maduro Robusto Extra, I used a straight cut to remove the cap. I then proceeded with the pre-light draw experience. I found the dry draw delivered a mix of mocha (a fusion of chocolate and coffee notes) and earth notes. There also was a slight cedar note present. Overall, I considered this to be an excellent pre-light draw. At this point, I was ready to light up my Four Kicks Maduro Robusto Extra and see what the smoking phase would have in store. 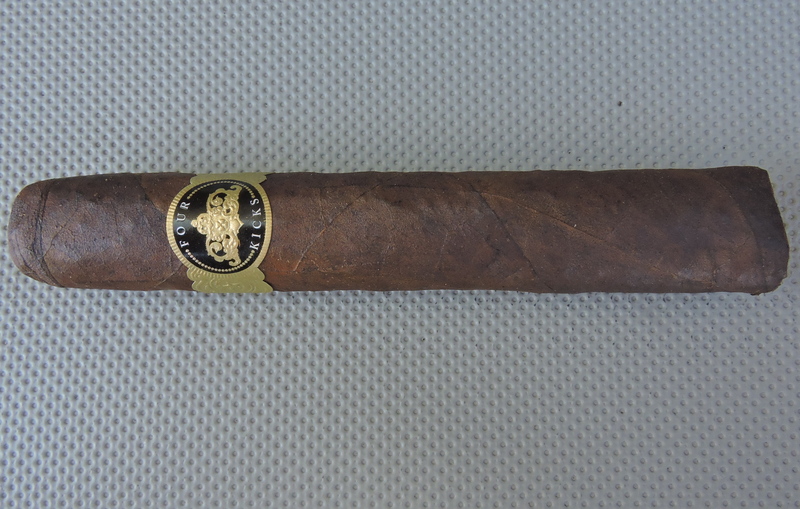 Right out of the gate, the Four Kicks Maduro Robusto Extra kicked off with rich mocha notes. The chocolate sweetness had an almost fudge-like sweetness, and the coffee component of the mocha reminded me of rich espresso. There also were complementary notes of cedar, earth, and black pepper. On the retro-hale, I got an additional layer of cedar, black pepper, and even some of the mocha notes – helping to enhance the richness of the cigar. As the Four Kicks Maduro Robusto Extra moved into the second third, some of the earth notes started to slowly make their way into the forefront. The mocha started to shed some of the richness and sweetness it had during the first half. By the midway point, the earth eclipsed the mocha notes as the primary note. While the mocha was diminishing, there was an increase in the black pepper and to a lesser extent an increase in the cedar. The last third saw the earth notes remain primary. The mocha took on more of a dark chocolate flavor and started to get a little of the richness back. Meanwhile, the increase in the pepper and cedar notes leveled off. This is the way the Four Kicks Maduro Robusto Extra came to a close. The resulting nub was firm to the touch and cool in temperature. In terms of the burn, the Four Kicks Maduro Robusto Extra maintained a relatively straight burn path and straight burn line. This was a burn that did require some touch-ups to keep things straight. While the amount of touch-ups wasn’t excessive, it wasn’t a “set it and forget it” burn either. The resulting ash had a salt and pepper color. This was an ash that I would consider slightly loose. As for the burn rate and burn temperature – both were ideal. The draw of the Four Kicks Maduro Robusto Extra was definitely on the open side. It was a little more open than I prefer. This resulted in a lot of smoke production. At the same time, I didn’t find the open draw had an impact on the burn temperature or burn rate. I found the Four Kicks Maduro Robusto Extra to start out as a medium strength, medium to full-bodied smoke. Along the way, I did find both the intensity level of the strength and body gradually increased along the way. Toward the last third, the increase in intensity leveled off and in the end, the Four Kicks Maduro Robusto Extra remained a medium strength, medium to full-bodied smoke. This is a cigar I would recommend to an experienced cigar enthusiast. For the novice, it’s a great cigar to “graduate” to something in the medium/medium plus range. As for myself, this is easily a cigar I will smoke again – and it’s one I look forward to smoking in some different sizes. This is a cigar that garners box worthy consideration.